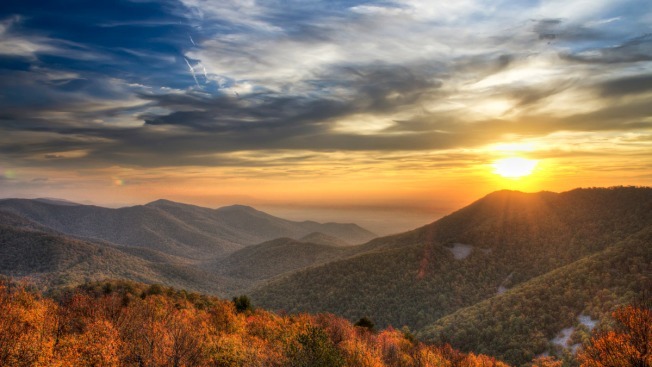 In this file photo, a sunset in Shenandoah National Park in Virginia is seen. On Saturday, April 21, National Parks across the country are allowing people to visit for free. The sun is shining, and the weather is finally warming up. What better way to celebrate than to visit one of the nation's beautiful national parks -- for free. The National Park Service will offer a "fee-free" day Saturday to kick off National Park Week. Fee-free days cover entrance fees, commercial tour fees and transportation entrance fees. Events throughout National Park Week include Earth Day (April 22), a Military and Veteran Recognition Day (April 28) and more. This year's theme is "Park Stars" to celebrate "everything from starry skies to superstar volunteers, park features, and resources," according to the NPS website. In honor of Earth Day on Sunday, the NPS is celebrating the 50th anniversary of the National Trails System, as well as the Wild & Scenic Rivers System. And next Sunday, they'll celebrate National Park Rx Day -- another opportunity to get out and spend some time at a national park or trail. Find more info about National Park Week events here. Find the full list of participating parks here.